Many investors have asked the question of how to figure out when and if a stock's overvalued. The price-to-earnings ratio provides a quick way to estimate a company's value, but it doesn't mean much until you understand how to interpret the result. A stock is considered overvalued when its current price isn't supported by its P/E ratio result or earnings projection. The P/E ratio is also known as an earnings multiple. If a company's stock price is 50 times earnings, for example, it's likely overvalued compared to a company that's trading for 10 times earnings. 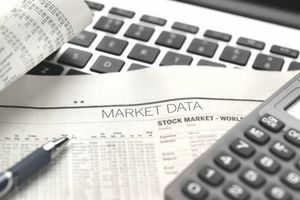 Although some investors believe the stock market is efficient and the average investor would not have information fast enough to identify overvalued stocks because it's factored into stock prices almost immediately, fundamental analysts believe you'll always find overvalued or undervalued stocks in the market because of investor irrationality. So, how can you tell if a stock is overvalued? There are various types of useful signals that may indicate a closer look is warranted. It's useful to start by reviewing a company's annual report, 10-K filing, income statement, balance sheet, and other disclosures to get a feel for the firm's operations using easily accessible information. Although many investors rely on the P/E ratio, if you're looking to dig a bit deeper, there are other ways of testing whether a stock's overvalued. The absolute upper threshold that most people want to consider is a ratio of 2. In this case, the lower the number the better, with anything at 1 or below considered a good deal. Again, exceptions might exist, such as an investor with a lot of industry experience might spot a turnaround in a cyclical business and decide the earnings projections are too conservative. Although a situation could be much rosier than appears at first glance, for the new investor, this general rule could protect against a lot of unnecessary losses. You might find that an overvalued stock's dividend yield Is in the lowest 20 percent of Its long-term historical range. Unless a business or sector or industry is going through a period of profound change either in its business model or the economic forces are at work, a company's core operations are going to exhibit some degree of stability over time, with a fairly reasonable range of outcomes under certain conditions. That is, the stock market might be volatile but the actual operating experience of most businesses, during most periods, shows a lot more stability, at least as measured over entire economic cycles than shown in the value of the stock. This can be used to the investor's advantage. Take a company such as Chevron. Looking back throughout history, anytime Chevron's dividend yield has been below 2.00 percent, investors should have been cautious as the firm was overvalued. Likewise, any time it approached the 3.50 percent to 4.00 percent range, it warranted another look at it was undervalued. The dividend yield, in other words, served as a signal. It was a way for less-experienced investors to approximate the price relative to the business profits, stripping away a lot of the complexity that can arise when dealing with financial data under GAAP standards. To track and check a company's dividend yield over time, map out the historical dividend yields over several periods, and then divide the chart into 5 equal distributions. Any time the dividend yield falls below the bottom quintile, be wary. As with the other methods, this one is not perfect. Successful companies suddenly run into trouble and fail; bad businesses turn themselves around and skyrocket. On the average, though, when followed by a conservative investor as part of a well-run portfolio of high quality, blue-chip, dividend-paying stocks, this approach may generate some good results. It can force investors to behave in a mechanical way akin to the way making regular, periodic investments into index funds, whether the market's up or down, does. Certain types of companies such as homebuilders, automobile manufacturers, and steel mills have unique characteristics. These businesses tend to experience sharp drops in profit during periods of economic decline, and large spikes in profit during periods of economic expansion. When the latter happens, some investors are enticed by what appear to be fast-growing earnings, low p/e ratios, and, in some cases, large dividends. These situations, known as value traps, can be dangerous. They appear at the tail end of economic expansion cycles and can ensnare inexperienced investors. Seasoned investors would recognize that in reality, the P/E ratios of these firms are much, much higher than they appear. For example, if a company earns $1.00 per share in diluted EPS, and 30-Year Treasury Bond yields are 5.00 percent, the test would show an overvalued stock if you paid $40.00 or more per share. That sends up a red flag that your return assumptions may be extraordinarily optimistic. Treasury bond yield exceeding earnings yields by 3-to-1 has only happened a few times every couple of decades but it is almost never a good thing. If it happens to enough stocks, the stock market as a whole will likely be extremely high relative to Gross National Product, or GNP, which is a major warning sign that valuations have become detached from the underlying economic reality. Don't forget to adjust for economic cycles, though. For example, during the 2001 post-September 11th recession, a lot of otherwise great businesses had large one-time write-offs that resulted in severely depressed earnings and very high P/E ratios. The enterprises stabilized in the following years because no permanent damage had been done to their core operations in most cases. It's important for investors to understand the distinction between refusing to buy a stock that is overvalued and refusing to sell a stock you hold that has temporarily gotten ahead of itself. There are plenty of reasons an intelligent investor may not sell an overvalued stock that's in his or her portfolio, many of which involve trade-off decisions about opportunity cost and tax regulations. That said, it's one thing to hold something that might have run out 25 percent higher than your conservatively estimated intrinsic value, and another entirely if you're holding stocks with values so inflated they make no sense at all in a sane market. One danger with new investors is a tendency to trade often. When you own stock in a great business, which likely boasts a high return on equity, high return on assets, and/or high return on employed capital, the stock's intrinsic value is likely to grow over time. It's often a mistake to part with the company's stock just because it might have gotten a bit pricey from time to time. Look at the returns of two businesses, Coca-Cola and PepsiCo, Even though the stock price has been overvalued at times, an investor would have been filled with regret later after selling off her stake.